CINCINNATI (AP) — Drummer Steven Adler rejoined Guns N' Roses on stage in Cincinnati to mark his first performance with the band fronted by Axl Rose in more than a quarter century. 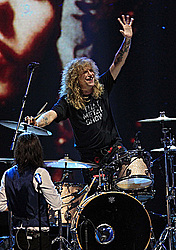 Video of the Wednesday night concert shows Rose introducing Adler before performing "Out Ta Get Me" and "My Michelle" from the band's 1987 debut album "Appetite for Destruction." Adler was thrown out of the band near the height of its popularity in 1990 due to drug use. He played with guitarists Slash and Duff McKagan at the band's 2012 Rock and Roll Hall of Fame induction, but Rose didn't take part. The band is currently on a summer tour featuring Rose, Slash and McKagan performing together for the first time in more than 20 years.